Harlan Ellison, who passed away on 28 June, was a grand master of science fiction who published over 1,700 works and won multiple awards from the Hugo to the Edgar Allan Poe. “I Have No Mouth, And I Must Scream” is one of the ten most reprinted stories in the English language. He also was known for being a crank and had no love for video games, calling them “time wasters.” When he was approached by Cyberdreams about optioning the story for a game adaptation, he was sceptical. Still, the financials worked and the opportunity seemed promising, so he agreed. On the surface, it seemed like a strange choice for a game, as the short story focuses on the psychological terror of five humans held captive by a hateful and murderous super computer called AM. 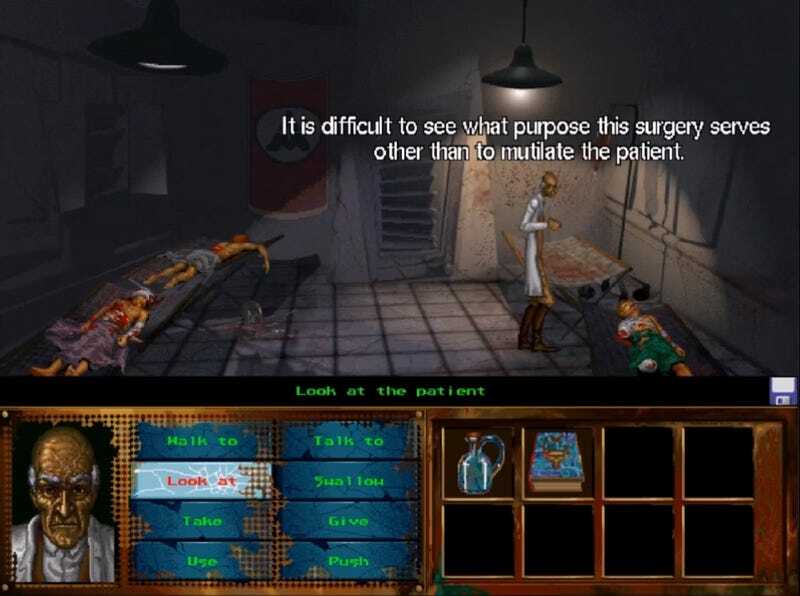 But the team at Cyberdreams, led by David Mullich, developed one of the best psychological horror point-and-click adventures games for the PC, a title which has made Kotaku’s Complete Directory of the Classic PC Games You Must Play and Nine Adventure Games We Wish Had Sequels. At one point, one of his computer programming professors caught Mullich using the university computer to create visual art and even generate poetry. When his professor called him into the office, Mullich believed he was in trouble. Instead, he was offered a job working as a clerk in a computer store that Sprouse owned with a couple of the other professors of the university’s’s Computer Science Department. In between writing programs, he worked on the sales floor, which would lead him to a pivotal encounter with Sherwin Steffin, who had had started a publishing company called Edu-Ware Services out of his apartment. After talking, Steffin recruited Mullich to write some games for him to publish. His first projects at Edu-Ware as a full-timer were programming educational tutorials to teach maths. But Mullich was obsessed with a television programme called The Prisoner, a 17-episode series from the 1960s in which a former British secret agent is imprisoned in a strange village and kept there until he’ll reveal why he abruptly quit the service. Psychological horror, memorably strange characters, and Kafkaesque scenarios abound in this fascinating show that broke all genre moulds. Mullich was able to convince Sherwin to allow him write a game based on this “surreal and metaphorical spy series about maintaining one’s individuality.” He worked on the Prisoner game for about six weeks, “designing and programming it in sort of a creative frenzy.” Fortunately, it turned out to be both a critical hit and a best seller. It also paved the way for his opportunity to work at Cyberdreams with Harlan Ellison. Mullich had long been a fan of Ellison’s work. The Hugo-award winning short story from the grand master of science fiction, “I Have No Mouth, And I Must Scream,” was one of Mullich’s favorites, as well as the Star Trek episode Ellis wrote, “The City On The Edge Of Forever,” with its mix of ethical dilemmas, time travel, and Nazis. Mullich said that by the time he came to work at Cyberdreams as producer of the I Have No Mouth, And I Must Scream video game, the original game designer David Sears had “departed from the project.” But Sears had made several key contributions to the design. 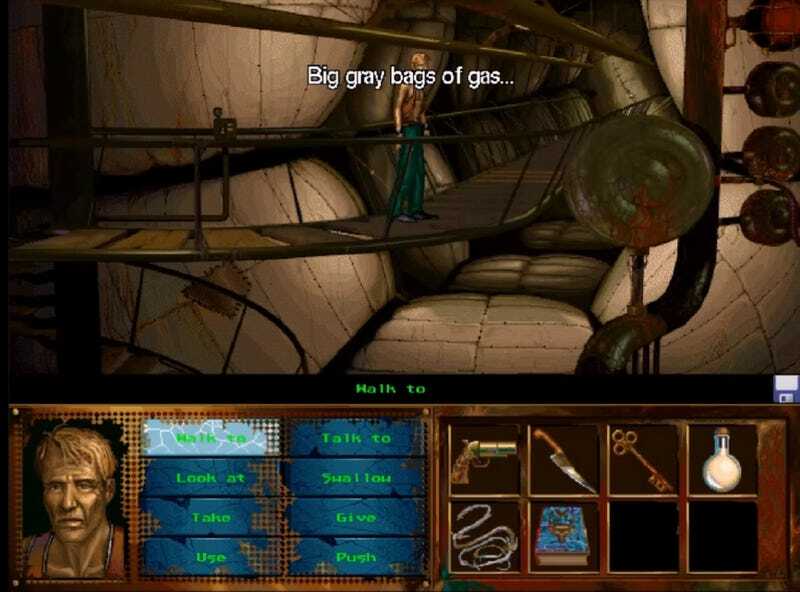 Sears and Ellison had worked out the story for each of the game scenarios; the grim depiction of the five characters is one of the most notable and disturbing aspects of the game. “Antihero” would undersell how horrible characters like Nimdock and Benny were in their former lives. It’s a harrowing journey, focused on the psychological anguish of each character, tormented by AM as well as their own sense of guilt over their past actions. Unfortunately, by the time Sears had left, the game design document was only half finished, and a lot of detailed design work needed to be done before the game could be programmed. “David was not available for me to consult with, and Harlan’s memory of his discussions with David about each of the game’s scenarios was hazy,” Mullich said. The biggest writing challenge Mullich faced was “to try to put myself in the mindset of each of these characters,” he said. It was dark material to channel, considering the trauma each of the characters has, from Benny dealing with his actions during war, Ellen facing demons from her past, and Nimdock recovering his memories at a concentration camp and realising he is the face of true evil. 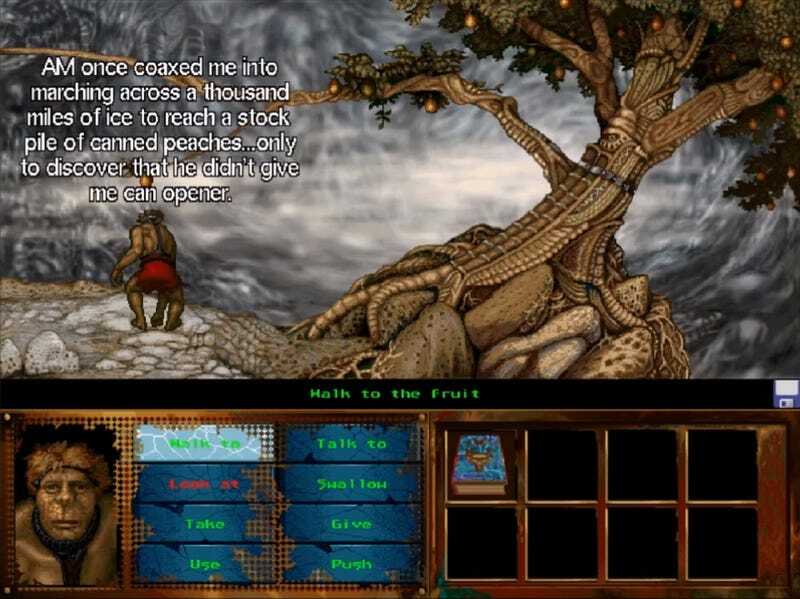 When it came to the game mechanics, David Sears had described a point-and-click system, but Mullich knew they couldn’t specify a user interface without input from the developer. 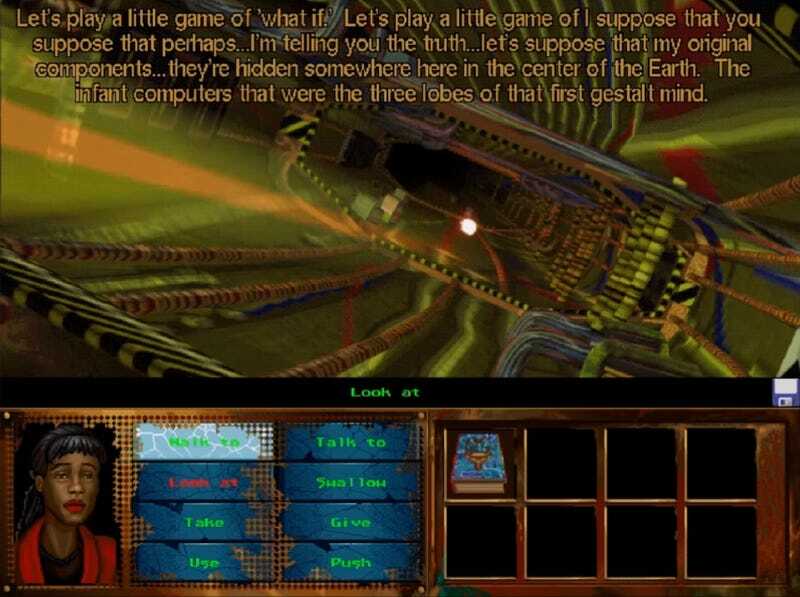 Cyberdreams no longer did its game development in-house at the time, so Mullich had to find a studio to do the programming and artwork for the game. He chose The Dreamers Guild, a studio founded by Robert McNally, who he’d first met when he was a teenager hanging out at Rainbow Computing. 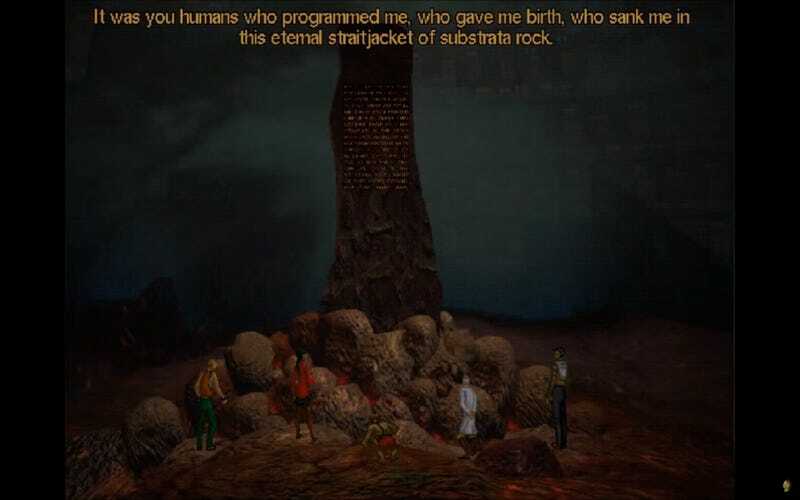 The environments reflected the twisted mental state of the five characters as well as the madness of the supercomputer AM. The art direction started with Ellison’s pointing out visual cues from the art and historical books that were part of his library, which numbered a quarter million books. The art team drew from German expressionist films as much as they did fantasy as in Ted’s journey to a medieval castle where he counters demons and a wicked stepmother. Every set, from the sinewy Zeppelin fuelled by animals, to the electronic pyramid Ellen navigates, and the torrid jungle where human sacrifice scars the soil, is distinctively unnerving. The artistic tapestry is intended to torture its victims with visual cues that trigger terrors from each of their pasts. The voice acting is one of the best parts of the game. For this, Mullich gives full credit to voiceover director Lisa Wasserman. “I gave her a description of all the game’s characters, and she came back to me with voice samples of actors to choose,” he said. There are multiple endings in the game, most of them tragic. Ellison put it more bluntly: “You cannot possibly win.” Several conclude the same way as in the short story, with your player transformed into a “great, soft jelly thing” that wants to scream but has no mouth. But there is one, somewhat happy, ending that seems like a victory. All three supercomputers are defeated and 750 humans that are cryogenically frozen on the moon are awoken with Earth being prepared for habitation again in 300 years. It can be reached if players act “ethically” and find some form of redemption for each of the five characters. I asked Mullich if Ellison was okay with that ending. “If Harlan objected to any of these endings, I don’t recall being aware of it,” he said. I Have No Mouth, and I Must Scream won multiple awards, including the “Best Dark Game of 1996” from Digital Hollywood and “Adventure Game of the Year” from Computer Gaming World. 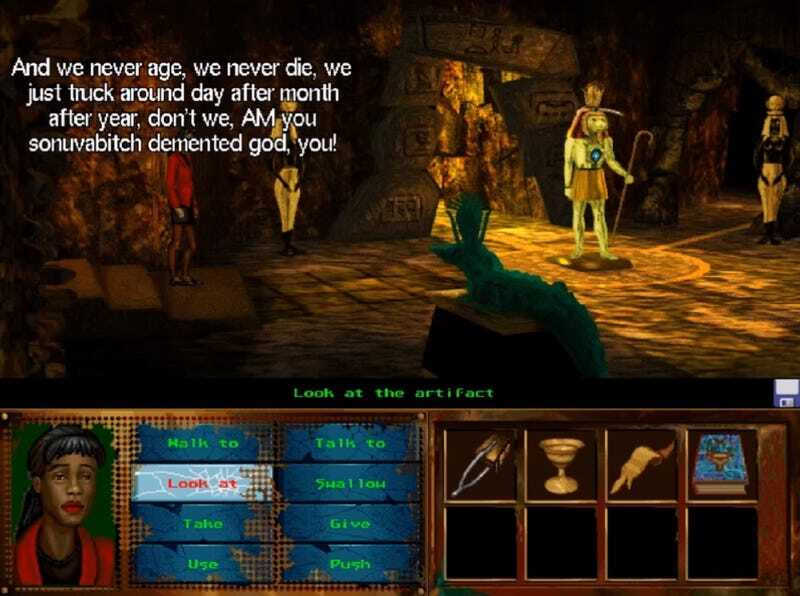 It’s also gathered a cult following and has found new life with its re-release on GOG from Night Dive Studio. Mullich would go on to join The 3DO Company and lead the development of Heroes of Might and Magic. After The 3DO Company shut down, he joined Activision to produce Vampire: The Masquerade Bloodlines. He’s currently the Faculty Lead at the Los Angeles Film School’s Game Production Group and does independent consulting work.